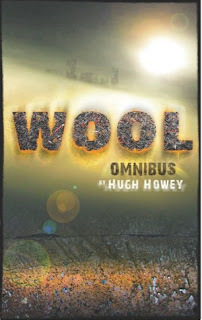 Both Carla, myself (and anyone we can convince to pick up the book) have become infatuated with Wool, by Hugh Howey. It's a post-apocalyptic Science Fiction novel the guy published himself and has been spreading by word of mouth like wildfire ever since. It's the most captivating 500+ pages you'll read this summer. But of course, I got stuck on a small food reference he made. Cornflour cookies. In the post-apocalyptic word, the outside environment is toxic and lethal within 30 minutes of exposure, even in a protective suit. So all that remains of society lives in a 150-story underground silo. They grow their food in hydroponic gardens, using dirt created from the composting morgue. Not exactly Napa Valley, but hey, you make do with what you have, right? At any rate, a character in the book sends along a rare treat, cookies! But made of cornflour. Cornflour, or cornmeal, makes sense in the Wool environment. If you have a limited amount of space, corn is a wonderfully diverse and rich plant that can fulfill tons of needs, with a production versus growing space ratio that wheat and other grains just can't match. And just think of all the things they make from corn today: corn starch for thickening, corn oil, corn syrup, fermented into ethanol, the husks as an abrasive...they even make chalk out of corn! Almost as frightening as the idea of a morgue dirt farm. But cookies? I wanted to try it. It also spoke to my interest in Pennsylvania Dutch cooking, where they relied heavily on corn as a staple crop in the new world. Corn meal doesn't react as well to "raw cooking," like wheat flour, as it's very coarse and "bran-ny." Imagine eating an entire cookie out of the cornmeal stuck to the bottom of a pizza pie. So to help soften the corn and ease its digestibility, I parboiled it in about half the amount of water you would normally use to make corn mush. 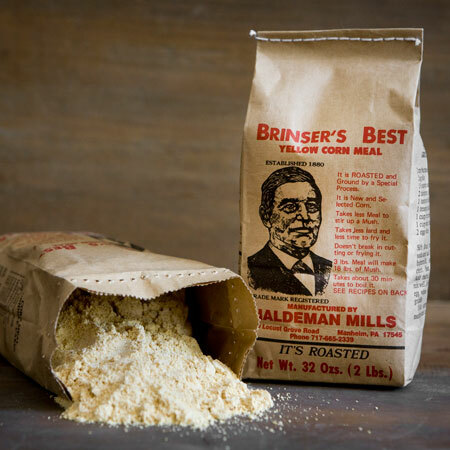 As usual I used Brisner's Best Corn Meal, which is an authentic, old fashioned meal made from new, local, roasted corn and probably the best I've had on the market. While the corn meal boiled into a thick paste, I added molasses and lard. My thought was that since molasses is a by-product of sugar refining, it would be more accessible than refined white sugar in a rationing situation. And with a lack of space for large grazing animals like cows, I doubt butter would be available and people would use animal fats. Spicing was pretty light - just vanilla and cinnamon, neither of which would probably be available, but then as I'm the one having to eat my way through an entire batch of these cookies, I thought I could treat myself. Some even got pecans! After the cornmeal cooled in the fridge. I scooped out little balls of the firmed up paste and plopped them on a baking sheet. After about 15 minutes they came out slightly browned, but still oddly flexible and "rubbbery." I think that's due to the gummy nature of cooked cornmeal and polenta, but it gave them an unusual texture. Some "professional" cornmeal cookie recipes used 1 cup white flour and 1/2 cup corn meal, which still gave you that crisp, traditional cookie crunch. But that didn't seem realistic to the rationing I was imposing on myself. Why even go through this exercise if I was just going to bend the rules to make something taste conventional? At the end of the day, with 30 odd little cookies in front of me, I was happy. They were soft, sweet, and gummy, with a light taste of vanilla and roasted cornmeal. I can't say they were the greatest cookie ever, but they felt real, and like a very honest, regional recipe someone might come up with if they actually did want to make a simple dessert with severe limitations on their diet and ingredients.